No matter what time of year it is, remember to wear eyewear that blocks 100 percent of UV rays to protect your eyes so you can see your best. (NAPSI)—Many people may not realize that spending time outdoors, whether during summer or any other season, can lead to vision issues caused from exposure to UV rays, such as the development of cataracts or even skin cancer around the eyes. In fact, a recent study by Transitions Optical revealed that three out of 10 people believe that protecting their eyes from UV rays is only necessary during the spring and summer months. But UV rays are present all year round, whether it is sunny or cloudy, and can still contribute to the development of serious vision issues. No matter what time of year, children are especially susceptible to vision damage caused by UV exposure, as they spend so much of their time outdoors, often participating in their favorite sports and activities. In fact, as much as 80 percent of children under the age of 15 already demonstrate signs of UV-related eye damage, according to the Review of Optometry. Despite the prevalence of vision damage in children caused by UV exposure, many parents may not be taking all the necessary steps to care for their children’s eyes. Although 66 percent of parents worry about their children developing vision issues, up to 25 percent have never taken them to an eye doctor, according to the Transitions Optical study. Families with multicultural backgrounds, particularly Hispanic, African-American and Asian-American, are at an even higher risk for certain vision conditions, such as cataracts, which can be caused by extended exposure to UV rays, as well as glaucoma. However, eight out of 10 respondents to the Transitions Optical study did not realize their ethnicity put them at an increased risk for these conditions. Dr. Charles Dominguez of Modern Eyewear Optometry in Lake Forest, California offers some simple steps everyone can take to protect the health of their eyes while spending time outdoors, no matter what time of year. 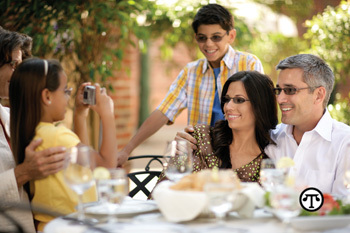 To find out which Transitions adaptive lenses are right for you and to locate an eye doctor, visit www.transitions.com.